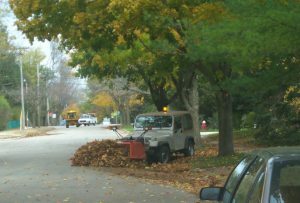 The city of Madison used municipal leaf collection, street cleaning, and leaf blowers to remove leaf litter from residential areas, and asked residents to pile their leaves adjacent to the street to limit excess debris. 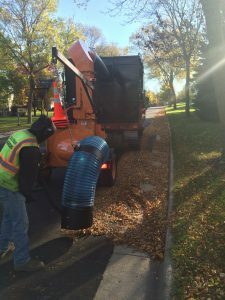 The timely removal of leaf litter can reduce harmful phosphorus concentrations in stormwater by more than 80% in Madison, Wis., according to a recent U.S. Geological Survey (USGS) study. Autumn leaf litter contributes a significant amount of phosphorus to urban stormwater, the study found. The USGS-led study, Evaluation of Leaf Removal as a Means To Reduce Nutrient Concentrations and Loads in Urban Stormwater, found that without removal, leaf litter and other organic debris in the fall contributed 56% of the annual total phosphorus load in urban stormwater compared to only 16% when streets were cleared of leaves prior to a rain event. The timely removal of leaf litter can reduce harmful phosphorus concentrations in stormwater by more than 80% in Madison, Wisconsin. Autumn leaf litter contributes a significant amount of phosphorus to urban stormwater. A USGS-led study found that without removal, leaf litter, and other organic debris in the fall contributed 56% of the annual total phosphorus load in urban stormwater compared to only 16% when streets were cleared of leaves prior to a rain event. From April until November of 2013 through 2015, scientists compared concentrations of phosphorus and nitrogen in stormwater from two residential catchments in western Madison that had similar tree cover. The city applied a leaf litter removal program from late September through mid-November at one site, but not the other. The researchers found significantly lower amounts of phosphorus and nitrogen at the site where leaves were removed. “The efficiency, frequency, and timing of leaf removal and street cleaning are the primary factors to consider when developing a leaf management program,” Selbig said. During the study period, the city of Madison used municipal leaf collection, street cleaning and leaf blowers to remove leaf litter from residential areas, and asked residents to pile their leaves adjacent to the street to limit excess debris. Leaf collection and street cleaning occurred about every 7 days from late September through mid-November.